Image scan, text and formatting by Jacqueline Banerjee. This image can be reproduced without prior permission for any scholarly or educational purpose as long as you credit the source. It would be good to link your document to this URL or refer to the Victorian Web in a print document. Consequently, Gould's display of an amazing 320 of the treasured birds (stuffed, of course, not alive) during the Great Exhibition was an enormous success. Although associated with the event at the Crystal Palace, it was arranged in a purpose-built structure in the gardens of the Regent's Park zoo, where the birds were suspended on practically invisible wires in revolving glass cases, colour-matched and subtly illuminated to dramatic effect. The display was visited by over eighty thousand people, including the royal party itself (see Russell 62). Gould's canny showmanship, coupled with the passion that lay behind his collection, had now propelled him to the very forefront of ornithology, not just at home but abroad as well. Acceding to his request, the zoo continued to display them for another full season. Perhaps it was John Ruskin who responded most ardently to Gould's enterprise: "I have made a great mistake," he is reported to have said. Knowing more about it now, we realise that Gould's life was no happier than anyone else's. He suffered deeply from the loss of two sons as well as that of his wife, and although his "ruling passion" helped him to recover from these terrible blows, there is no denying the "loneliness, anxiety, and pain that Gould experienced as an old man" (Tree 214). The "birdman" had had his professional disappointments, too. For example, after seeing his first hummingbird in the wild in Philadelphia in 1857, during his whistle-stop tour of North America, he had managed to bring two live ones home — but these precious treasures had only survived for a couple of days. So he clung to his collection of stuffed ones, not selling them once he had no further use for them, as he did with other birds: "He never parted with his hummingbird collection" (Pascoe 452). These diminutive, glistening, fairy-like creatures never lost their powerful hold over him. This is another of the new and very remarkable species that have rewarded the researches of modern naturalists in the magnificent region of Santa Fe de Bogota, where most of the specimens sent to Europe have been procured; it appears, however, to possess a wide range, for I have heard of its being observed in the Caraccas, and my friend Sir William Jardine, Bart., has lately received from Mr. Jameson an example obtained in the shrubby region on Pichincha in Quito, at an elevation of from 11,000 to 12,000 feet above the sea. Mr. Hartweg, the celebrated botanical traveller, informs me that he has seen this bird in a state of nature, and that he frequently saw it engaged in procuring its insect food from the lengthened corollas of the Brugmancia for exploring which its lengthened bill is so admirably fitted; affording another instance of the wonderful adaptation of structure to a given purpose so frequently observable in every department of Nature's works. The male has all the upper surface and the wing-coverts bronzy green, assuming a coppery hue on the head; behind the eye a spot of white; throat blackish brown; on either side of the throat a broad crescentic band of shining emerald green; under surface bronzy green; under tail-coverts bronzy green, fading into white on the edges of the feathers; wings purplish brown; tail dark brown with a bronzy lustre; bill blackish brown; feet yellowish brown. Total length, 8 3/4 inches; bill, 4; wing, 3; tail, 2 1/4; tarsus, 1/4. The female has the upper surface as in the male, except that a few white feathers appear on the lower part of the back; a line of white is also perceptible behind the eye; wings purplish brown; tail olive-green; throat brown, each feather margined with gray; under surface bronzy green, mottled with brown, and an indication of the bright bands on either side of the throat. Total length, 6 1/2 inches; bill, 3; wing, 3; tail, 2 1/4; tarsus, 1/4. The upper surface of the young male is of a more coppery hue than that of the adult; the throat is mottled brown and white, produced by each feather having an oblong spot of brown at the tip; on either side of the throat a band of lustrous green with bronzy reflexions, amidst which the white bases of the feathers here and there appear; under surface coppery green, interrupted in like manner by the white bases of the feathers; under tail-coverts green, slightly margined with white. Much variation is found in the length of the bill in different individuals; I have remarked too that the young males of the year have longer bills than the adults; one of the former in my own collection measures four inches and three-eighths from the gape to the tip. The figures represent an adult male and female, and a young male, all of the natural size, on the Scarlet Trumpet Flower (Brugmansia sanguinea). Gould, John. 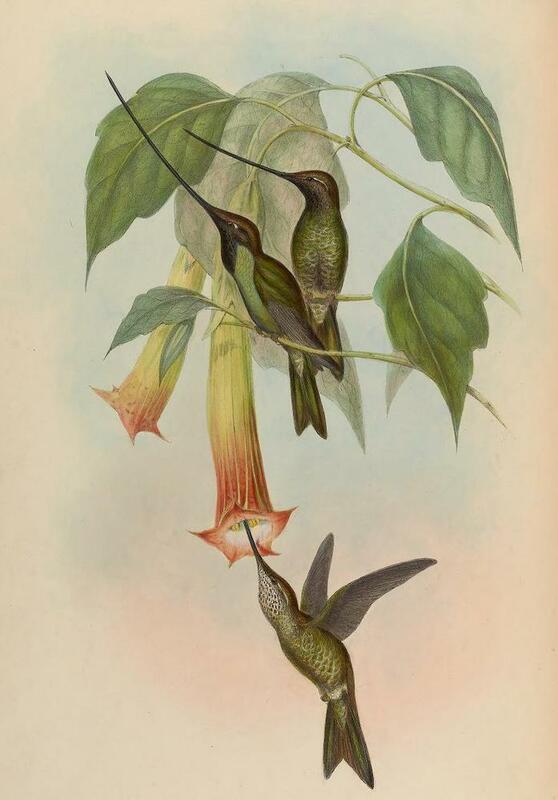 A Monograph of the Trochilidae or Family of Humming-birds, Vol. 4. Internet Archive. Contributed by Smithsonian Libraries. Web. 8 April 2019. Pascoe, Judith. The Hummingbird Cabinet: A Rare and Curious History of Romantic Collectors. Ithaca: Cornell University Press, 2006. Ruskin, John. Works, Vol XXXIV. Eds. E. T. Cook amd Alexander Wedderburn. London: George Allen, 1890. Internet Archive. Contributed by the Digital Library of India. Web. 8 April 2019. Russell, Roslyn. The Business of Nature: John Gould and Australia. Canberra: National Library of Australia. 2011. Tree, Isabella. The Ruling Passion of John Gould. New York: Grove Weidenfeld, 1991.